PAINTING AND ITS BODY ANALOG, athletics, both require endurance training. Practicing the art of shooting a basketball or developing proper running form is akin to learning to draw, requiring hand-eye coordination, fluidity, muscle control, and stamina. Physical and mental fitness are essential to do either activity well. Usually I only manage to paint for two or three hours at a time, but already this week I have had four- and five-hour stretches. It is energizing, relaxing — and draining. Painting is mostly pleasurable, but it is difficult at times to maintain concentration and control of my arm, wrist, and hand. Today I paint for six hours, comparable, perhaps, to a long training run for a 26.2-mile marathon. During long runs I experience extended periods of serene beauty, where I feel totally in sync, successfully balancing relaxation with effort, moving fluidly, breathing rhythmically. But there are other times when the pace is hard to sustain, physically and mentally. During these moments, my mind seeks relief from the relentless physical exertion, but also from the demands of concentration. The discomfort makes manifest my doubts about my ability to complete what I set out to accomplish. Running through these mental troughs, I become more fit and gain greater confidence that I will emerge stronger from the next one. The effect over time is that I run further, faster, and more often than I originally thought possible. 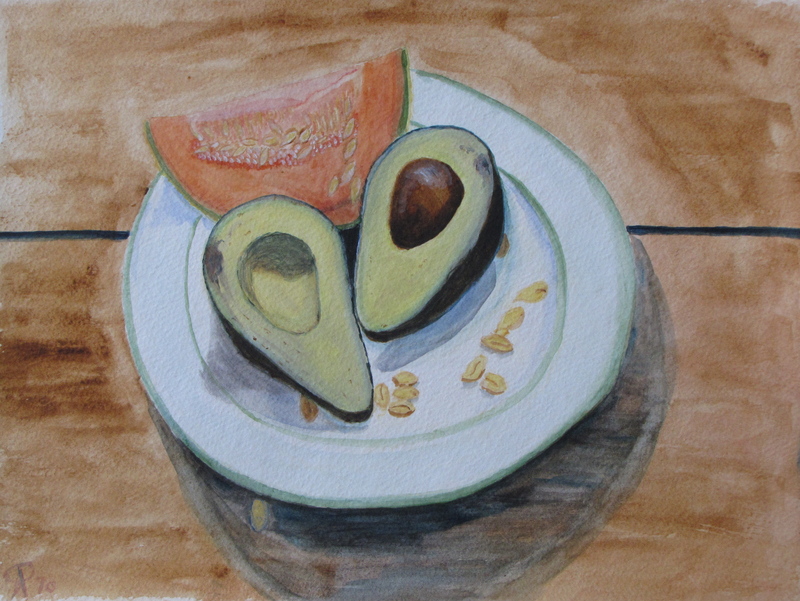 AS I BEGIN this still-life with avocado, I already sense a greater familiarity with its demands of time and patience, a result of the painting I have done leading up to it. I have used watercolors before, but never so intently as this week. I have learned a great deal in just these few days about layering, blending, mixing, and washing. I have a better command of my brushes and how best to use them, and my hand gradually is becoming more steady. FOR ALL THEIR SIMILARITIES, painting requires not running’s speed, but its antithesis. Unlike running’s perpetual motion, painting allows for, even demands, slowing down, stopping at times, practicing patience and cultivating introspection. I get up and walk away, the painting hovering near my consciousness the whole time — or not — as I make subcutaneous connections, choices, approaches. I stare at the painting from across the room, and again within reach of my palette. I study the plate of arranged fruit, clarifying planes and angles with my outstretched brush. I stare out the window to the ocean, off in the distance, thought abstracted in the waves. I make a bold, impulsive stroke or take minutes to trace a single line. I sip a cup of tea, peel an orange as the forms gradually gain shape and contour, slowly, unrecognizable at first. I add layers of color before arriving at a final, intricate shade, learning to trust in the deliberate, repetitive process, like a chant or prayer. The painting needs to be absorbed, allowed to sink in before it can paradoxically emerge. Part of it is seeing, becoming more observant, even mathematical at times. Some of it is about being on the surface of the objects I draw, sensing the avocado’s curve as though I am walking on it rather than seeing it from afar. In running, my goal is to move freely through space. In painting, it is to inhabit space, to supplement, or transpose, my vision with the tactile.